Graphene-Based Nanotechnologies for Energy and Environment explores how graphene-based materials are being used to make more efficient, reliable products and devices for energy storage and harvesting and environmental monitoring and purification. 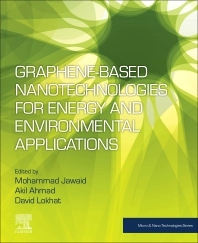 The book outlines the major sustainable, recyclable, and eco-friendly methods for using a range of graphene-based materials in innovative ways. It represents an important information source for materials scientists and engineers who want to learn more about the use of graphene-based nanomaterials to create the next generation of products and devices in energy and environmental science. Graphene-based nanotechnologies are at the heart of some of the most exciting developments in the fields of energy and environmental research. Graphene has exceptional properties, which are being used to create more effective products for electronic systems, environmental sensing devices, energy storage, electrode materials, fuel cell, novel nano-sorbents, membrane and photocatalytic degradation of environmental pollutants especially in the field of water and wastewater treatment. Mohammad Jawaid is currently working as a Fellow Researcher (Associate Professor), at the Biocomposite Technology Laboratory, Institute of Tropical Forestry and Forest Products (INTROP), Universiti Putra Malaysia, Serdang, Selangor, Malaysia and has also been a Visiting Professor in the Department of Chemical Engineering, College of Engineering, King Saud University, Riyadh, Saudi Arabia since June 2013. He is also a Visiting Scholar at TEMAG Labs, Department of Textile Engineering, Istanbul Technical University, Turkey. Previously he worked as a Visiting Lecturer, at the Faculty of Chemical Engineering, Universiti Teknologi Malaysia (UTM) and also worked as an Expatriate Lecturer under the UNDP project with the Ministry of Education of Ethiopia at Adama University, Ethiopia. He received his Ph.D. from the Universiti Sains Malaysia, Malaysia. He has more than 10 years of experience in teaching, research, and with industry. His research interests include Hybrid Reinforced/Filled Polymer Composites, Advance Materials: Graphene/Nanoclay/Fire Retardant, Lignocellulosic Reinforced/Filled Polymer Composites, Modification and Treatment of Lignocellulosic Fibres and Solid Wood, Nano Composites and Nanocellulose fibres, and Polymer blends. So far he has published 5 books, 12 book chapters, and more than 130 International journal papers and 4 Published review papers in the Top 25 hot articles on Science Direct during 2014-2015. He is also the Deputy Editor-in-Chief of the Malaysian Polymer Journal and Guest Editor for Current Organic Synthesis and Current Analytical Chemistry. He is the reviewer of several high impact ISI journals (44 Journals). Akil Ahmad is a Research Fellow at University of KwaZulu Natal, South Africa as Postdoctoral Fellow. He was previously Visiting Researcher of Chemical Engineering, Centre of Lipid Engineering and Applied Research, University Technology Malaysia (UTM), Malaysia. His research interest in the areas of environmental pollutants and their safe removal, synthesis of nanoparticles and Nano-sorbents (GO, CNT), photo-degradation and antimicrobial effects, preparation of various Chelating sorbents/adsorbent to prevent the environment, water and wastewater treatment, adsorption and ion-exchange, instrumental methods of analysis, thermodynamic and kinetic studies, and preconcentration and method validation with standard reference materials.